Caracas: Tens of thousands of Venezuelans skipped the traditional Carnival holiday that is a yearly highlight for many to instead march in nationwide protests against President Nicolas Maduro’s government. The demonstrations, part of a wave of nearly month-old protests that have left 18 people dead and more than 260 injured, were called in outrage at insecurity, government repression and shortages of basic goods. “This is the people’s struggle against the inefficient government. Maduro, you have lost today the streets of Venezuela because the streets belong to the people,” Central University of Venezuela student leader Juan Requesens told nearly 20,000 people gathered in Caracas. The students called for a “genuine dialogue” with the president and for discussion on ending the standoff marred by violence. Several hours later, a group of radical protesters armed with sticks and stones gathered in the capital’s Plaza Altamira and faced off with members of the National Guard who responded with water cannons, tear gas and birdshot. Officials said the clash left 17 wounded from birdshot or suffering from gas inhalation. On Sunday, authorities also released dozens of protesters and an Italian photographer, but that did nothing to appease the demonstrators. Four marches converged in the afternoon at Plaza Brion in the wealthy Chacao district, with many protesters clad in white as they blew horns and whistles, and carrying Venezuelan flags. Demonstrators poked fun at Maduro’s decision to call a six-day holiday to mark the beginning of Carnival, an annual celebration that normally sees many Venezuelans leave the cities and head to the beach. Critics say the holiday was a cynical attempt to undermine the demonstrations and many opposition mayors cancelled ceremonies. The latest wave of protests, which erupted on February 4, has grown into the biggest threat to Maduro and his leftist government since he succeeded socialist icon Hugo Chavez last year. Elsewhere across the country, local media reported that thousands of protesters marched in the western city of San Cristobal, the cradle of the protest movement. Marches were also held in the cities of Barquisimeto, Valencia and Puerto Ordaz. In San Cristobal, a university leader responded to Maduro’s request that students participate in a national dialogue, already boycotted by the opposition. 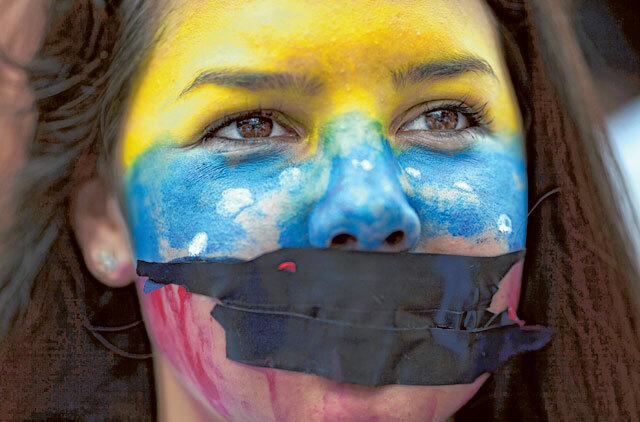 “I challenge Mr Maduro, if you want dialogue, come to Tachira (state) and listen to the students,” said Catholic University student leader Genesis Garcia, quoted by the Ultimas Noticias newspaper. The antigovernment protesters were even remembered thousands of miles away at the Academy Awards ceremony in Los Angeles. Jared Leto on Sunday paid tribute to the protesters, along with the people of crisis-hit Ukraine, as he won the best supporting actor Oscar for his work in Dallas Buyers Club. “To all of the dreamers out there around the world watching this tonight, in places like Ukraine and Venezuela, I want to say, we are here,” Leto told the Academy Awards crowd as he clutched his golden statuette. Maduro, who denounces the demonstrations as part of a Washington-backed coup plot aimed at toppling his government, has been accused of targeting the domestic and foreign media, while hundreds of people — including opposition leaders — have been detained. A total of 863 people have been arrested since February 9, according to rights group Foro Penal said, with 30 still behind bars. Several foreign journalists, including an Italian photographer and an American reporter, were among those arrested on Friday. Marco Ruiz, head of the SNTP press workers’ union, said the arrests of foreign reporters were part of a deliberate government policy to intimidate the overseas press in the same way they had already done with local media. “The pattern of attacks that is repeating itself is now against international correspondents,” Ruiz said. On Tuesday, Venezuela’s Foreign Minister Elias Jaua will meet with UN Secretary-General Ban Ki-moon in Geneva to discuss the protests.